Wall mounted slatwall panel with trim. Add slatwall accessories sold separately. Header with white or black vinyl with your choice of copy (specify your custom text phrase when ordering). Units mount with screws and anchors provided. Please note the following when you order: Your custom copy Font Choice (Helvetica or Times Roman) Copy justification (centered, flush left, or flush right) *Shown above in Helvetica with centered justification. Perfect for merchandising! 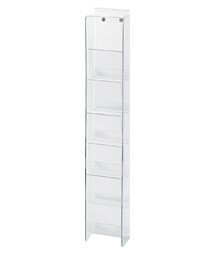 This mini slatwall tower stands 60"h and will accommodate accessories up to 11"w. Ideal for use in tight spots. Image does not show the 1-color header. 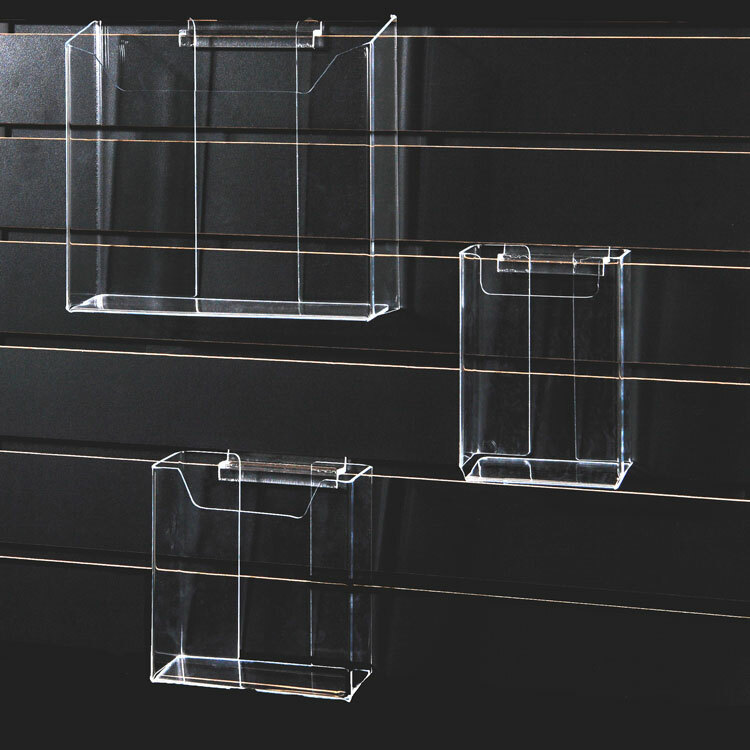 These laminated slatwall displays provide maximum flexibility for your constantly changing promotions. Order any combination of optional slat wall accessories. Accessory pieces easily hook into slat wall panel grooves on each service. This does not come with a header. Kiosk comes fully assembled. Ships via truck. Remember to check out our accessories! Measures: 71"h with 22"w x 48"h mounting surface. Perfect for merchandising! 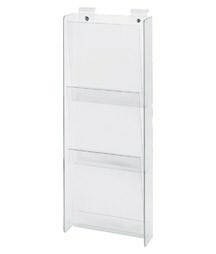 This mini slatwall tower stands 60"h and will accommodate accessories up to 11"w. Ideal for use in tight spots. 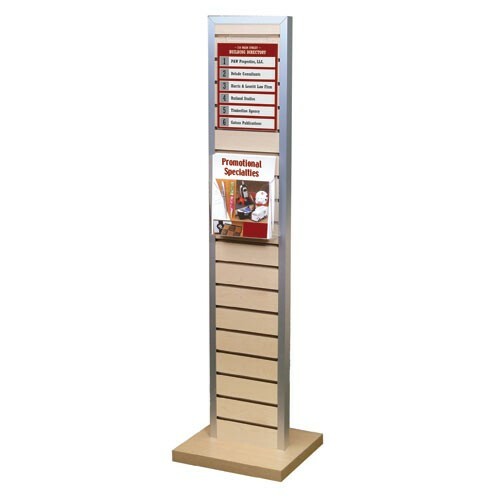 These laminated slatwall display provides maximum flexibility for your constantly changing promotions. Order any combination of optional slatwall accessories. Accessory pieces easily hook into slatwall panel grooves on each service. This model does NOT come with a header. Kiosk comes fully assembled. Ships via truck. Remember to check out our accessories! Measures: 72"h with 22"w x 48"h mounting surface. Wall mounted slatwall panel with trim. Add slat wall accessories sold separately. Header with white or black vinyl with your choice of copy (specify your custom text phrase when ordering). Units mount with screws and anchors provided. More sizes and custom slat walls are available! 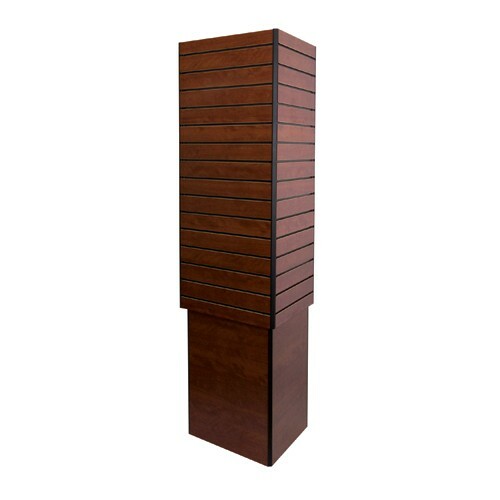 An upscale, high end appearance ideal for showcasing merchandise, sales materials, promotional posters and more! Hand-crafted from solid oak available in 5 standard finishes. 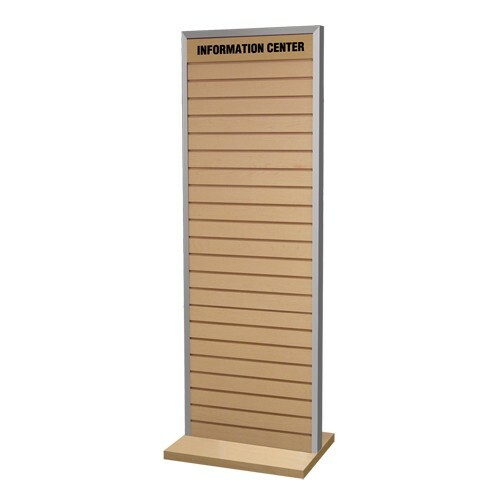 Features a 22"w x 46-1/2"h slatwall panel, ready for you to add optional accessories. Slatwall available in 4 standard laminate finishes. Remember to check out our accessories! 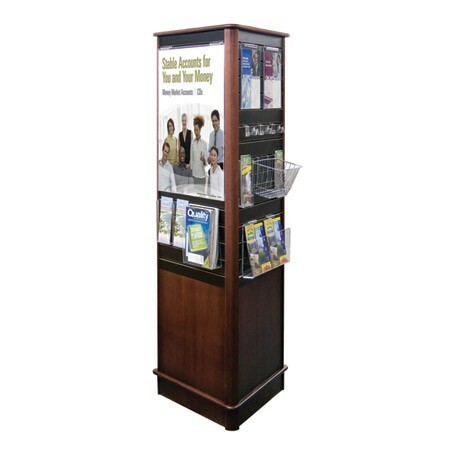 Measures: 72-3/4"h. Slatwall is 22w x 46-1/2"h.
These laminated slatwall display provides maximum flexibility for your constantly changing promotions. Order any combination of optional slatwall accessories. Accessory pieces easily hook into slatwall panel grooves on each service. 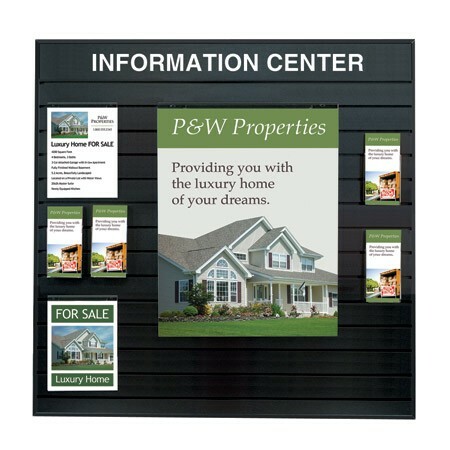 The top 4" matching laminate panels allows for your custom imprinted text message in white or black vinyl only. Kiosk comes fully assembled. Ships via truck. Remember to check out our accessories! Measures: 72"h with 22"w x 48"h mounting surface. 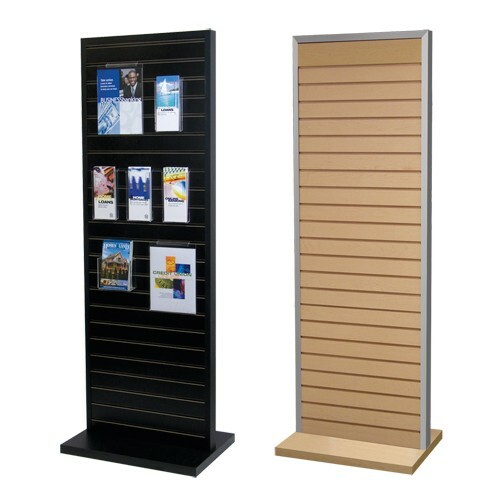 Sign frames are a great way to display your promotional posters. 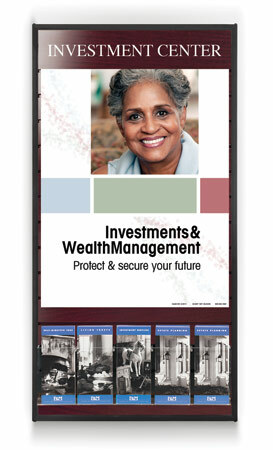 See our large selection of promotional graphics/posters. Remember you can customize any of our graphics to fit your needs! 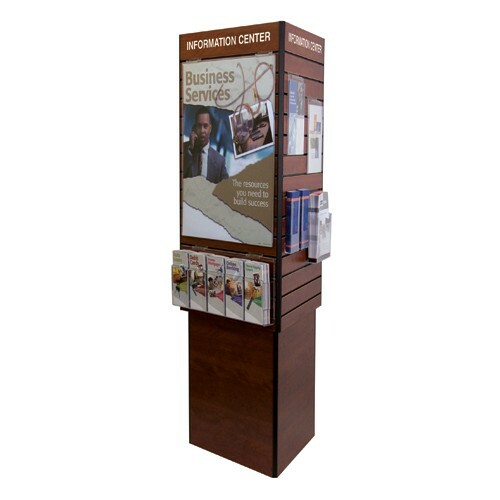 These laminated slatwall displays provide maximum flexibility for your constantly changing promotions. Order any combination of optional slat wall accessories. Accessory pieces easily hook into slat wall panel grooves on each service. 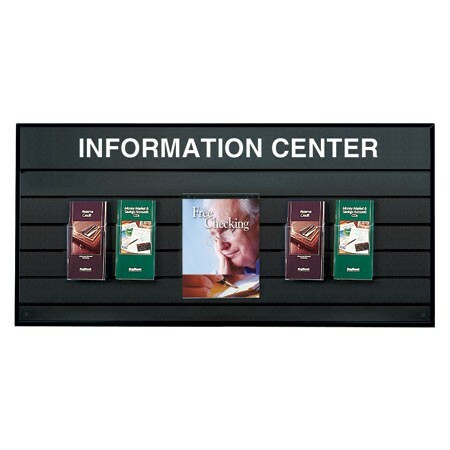 The top 4" matching laminate panels allows for your custom imprinted text message in white or black vinyl only. Kiosk comes fully assembled. Ships via truck. Remember to check out our accessories! Measures: 71"h with 22"w x 48"h mounting surface.